During the early 1980s, McLaren, Porsche and Mansour Ojjeh signed an agreement, which stipulated that the German manufacturer would build and supply engines to the British Formula 1 team. The bill was picked up by Ojjeh and accordingly the twin-turbo V6 was re-badged TAG (Techniques d'Avant Garde). In addition to the F1 engine, Ojjeh also commissioned a bespoke Porsche 911 Turbo road car in the style of the awe-inspiring 935 GT-racers. This would be the very first car built by Porsche's newly established Exclusive Department. This replaced the 'Special Request Department', which also catered to the specific needs of Porsche's customers. Based on the latest 3.3-litre engined Type 930, Ojjeh's one-off Porsche featured the Flachbau or slantnose front-end, broad fenders and a massive rear wing. The single turbo flat-six was modified to produce around 375 bhp, which represented a 25% increase over the standard engine. The interior was also custom finished. Although officially dubbed by Porsche simply as the 'Porsche 911 Turbo Spezial', the unique machine is more commonly referred to as the 930/935 Turbo or the 935 Street. 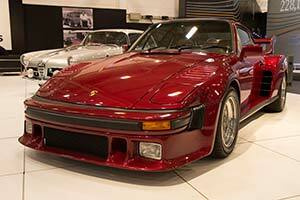 It sparked a lot of interest in period and was prominently featured in automotive and lifestyle magazines. Ojjeh only owned the car for a few years and among its subsequent owners was legendary American entrant John Mecom Jr.